Did Cosmic Brownies play as big of a role in your childhood as they did in mine? Embarrassingly enough, I’ve gotta admit that in middle school I went through boxes and boxes of those (seriously) sugary, artificially flavored, trans fat-laden rectangles of sin. Thankfully, there’s a better option now with this Cosmic Brownie recipe! These Homemade Cosmic Brownies are ooey gooey, and soft and chewy. They’ll give you ALL the feels. When I lack baking inspiration, I ask my boyfriend what he’s craving and what I should bake. I honestly don’t know why I ask people this because they always request something super difficult to make or something that’s nearly impossible to healthify. So of course, when I asked him what he wanted, he said Cosmic Brownies. I immediately shut him down because I had never seen a healthier or natural alternative to those rainbow-colored chocolate drops that are scattered over the brownies… until last week when I was at Trader Joe’s and found these cool, naturally-dyed chocolate sunflower seed drops! My jaw dropped I was so happy. It was at this moment that I had a browniepiphany. I knew in my heart that it was time to make better-for-you Cosmic Brownies. I raced home and got baking. These Homemade Cosmic Brownies are off the hook. They’re the fudgiest. brownies. ever. Maybe even the best thing you’ll ever eat. And they’re super easy to make by using my favorite fudge brownie mix. It’s organic, all-natural, and contains just six ingredients. Yes, SIX BASE INGREDIENTS: organic cane sugar, organic wheat flour, organic chocolate chips, organic cocoa, organic tapioca starch, sea salt, and natural flavor. Hallelujah! Have you ever seen the ingredient list for other storebought brownie mixes and Cosmic Brownies? It’s pretty horrendous. They’re all pretty much the same with the top ingredients being bleached flour, high-fructose corn syrup, and partially hydrogenated oils, followed by TBHQ (a preservative), artificial food dyes, and artificial flavors. How appetizing, right? But sometimes those throwback classics are all you need. And these Cosmic Brownies are one of them. 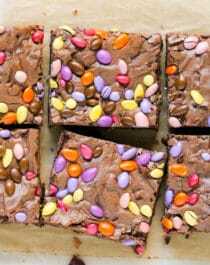 A classic, rich, no-frills recipe — brownies, rainbow chocolate drops, boom. If you’d normally skip a treat like this, you won’t anymore! These are dense, fudgy, decadent, and sweet, they’re just too good to pass up! In a large bowl, stir together the brownie mix, melted butter, and eggs until well blender (batter will be thick). Scoop mixture into the prepared pan and spread it out. Sprinkle the chocolate sunflower seed drops on top and gently press them into the batter. Bake for 30 minutes, then let cool completely. Store in a tightly sealed container at room temperature for up to 5 days. To take these brownies to the next level (and make them more authentic like the prepackaged kind), spread some chocolate frosting over the brownies and sprinkle the chocolate sunflower seed drops on top rather than baking them directly onto the brownies. This copycat Cosmic Brownie recipe will bring you back to your childhood. They’re so dense, fudgy, and delicious, it’s hard to believe they’re better for you than the storebought kind. No artificial ingredients, no artificial food dyes, no preservatives. These Homemade Cosmic Brownies are probably the most dangerous recipe I have ever made. Can you even handle them?? ?